Ballpark Basics: A simple concrete stadium with no shade and a great crowd. 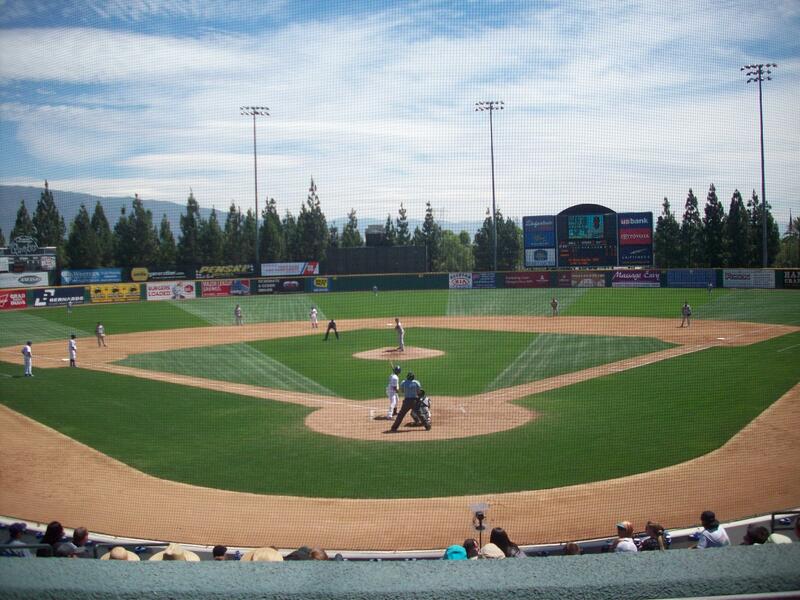 The Rancho Cucamonga Quakes are surrounded by strip malls. So much so, that when driving up, you might start to question whether you are in the right spot. Several turns off the main road take you into store parking lots, one turn gets to you to what was formerly (and still occasionally) called the Epicenter, but today is known more commonly as LoanMart Field. There is one big benefit to all this commercialization though, the Quakes have a $4.00 parking fee at the field but the sea of surface lots for the stores give you a plethora of free options. The walk up to LoanMart Field is interesting. It’s a longer than usual hike up to the stadium because the ballpark is built into a suburban multi-field type complex, with LoanMart field being the main attraction with lots of offshoot fields for adult beer league and non-professional games. 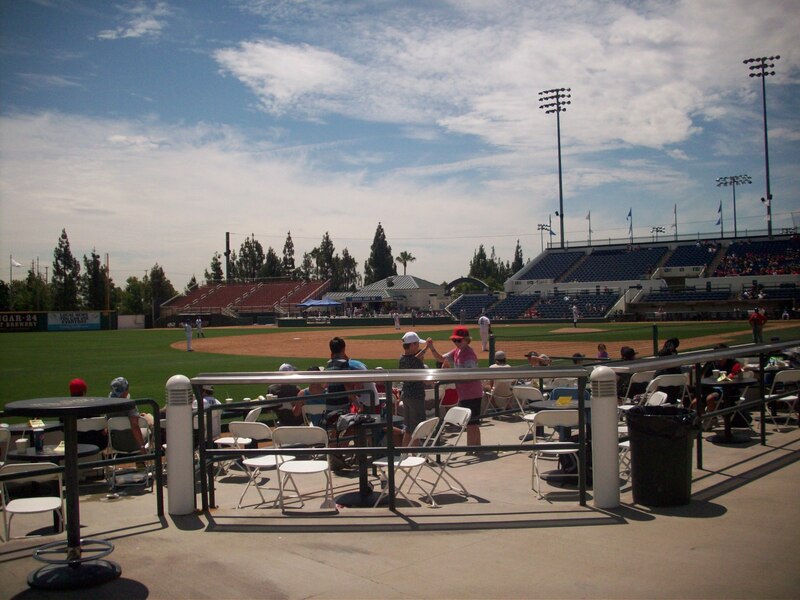 LoanMart Field -like many Class-A level parks – is nothing special, but like most things in California, tickets are expensive. Or at least, more expensive than a team of this level would typically be able to command. Completed in 1992 and opened for the ‘93 season, and updated in 2012. 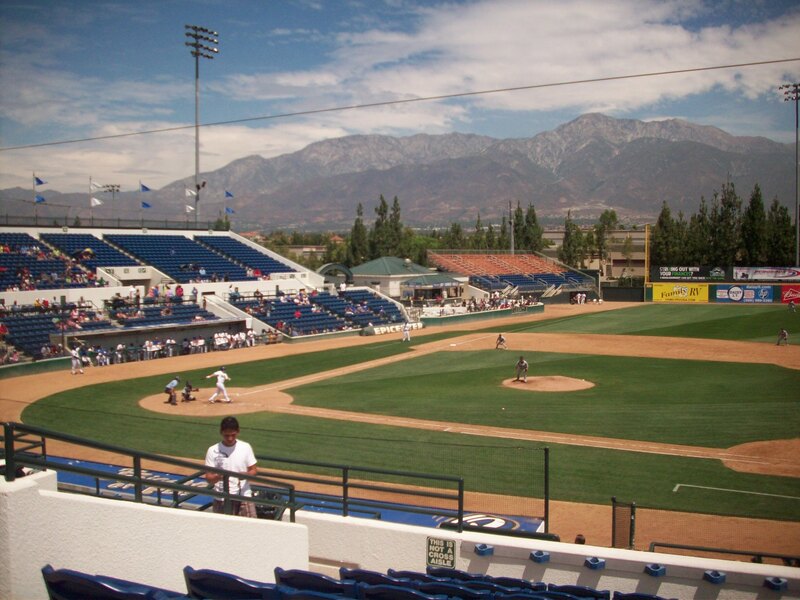 The Quakes are the only team to have played there although they have changed affiliations three times over the years, from the Padres to the Angels, and finally (since 2010), the Dodgers. They are part of the California League and have won the championship just once, back in 1994. 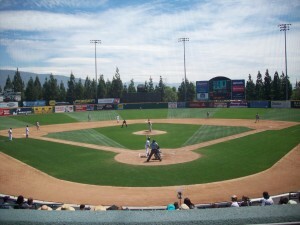 LoanMart Field is a traditionally shaped and small ballpark with an open, walkable concourse that divides the lower bowl from the upper “club”. Seating options range from two portable bleachers to the fancy box seat options, which are padded. It’s worth noting that there is almost no shade available – quite a conundrum for a redhead like Gillian trying to deal with the California sun. Most visitors that day came umbrella-in-hand, ready to provide their own portable shade, but there was no relief for those of us who weren’t in-the-know. On the topic of the fans, the ones here know and love their “Quakes”. Many places we visited in the state had lots and lots of tourists, but here the fans were loud and into the game, cheering on their favorite players by name. 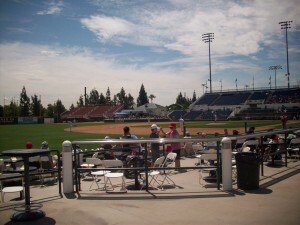 Doubtless the fact that it was “camp day” with children from local day camps in attendance didn’t hurt either, but even those not associated with these groups had no trouble – or qualms – about chiming in with the “da na na nana na naaaa Quakes!” chant that recurred often throughout the game. The crowd is also spurred on by their “Ralleysaurs” a mascot named Tremor who was also out, about, and very active despite the heat. Fun Fact: Tremor wears jersey number 4.8; a pretty decent magnitude when it comes to quakes. As mentioned earlier, the Quakes began a series of renovations in 2012 which were mainly focused on the team clubhouses. 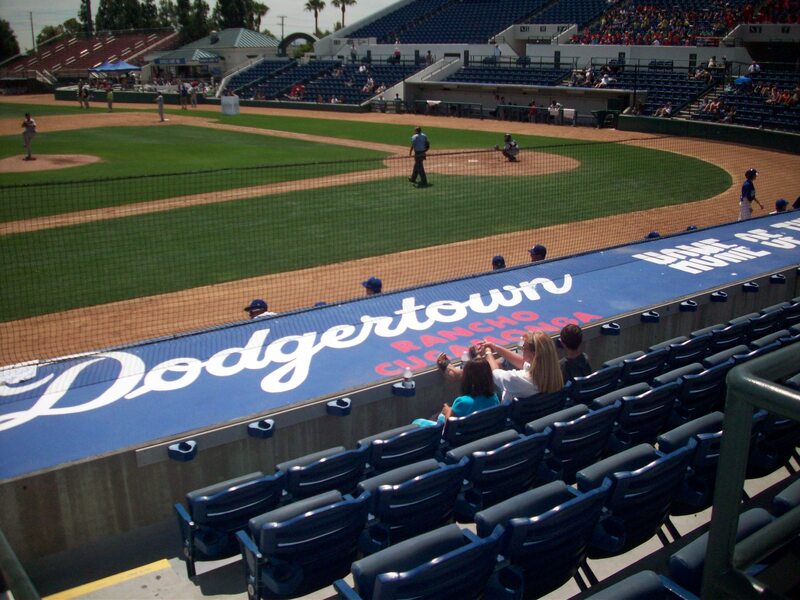 For the 2013 season some of the seats on the left side were removed to make room for a new batting cage. The new batting cage allows fans to watch the players warm up, and has a separate section open during games where willing participants can toss a ball or two. The food choices are typical, and what you’d expect from ballpark food, hot dogs, sodas, ice cream. 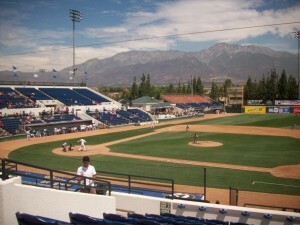 Craft beer options are limited – actually beer choices in general are limited – and the only ones available on this day were Bud, Miller and Shock Top, despite the stadium being a walkable distance from the Rancho Cucamonga Brewery. All in all, it’s a pretty standard stadium with the additional fields providing additional usability in the suburban environment. Even being tourists ourselves, we enjoyed the opportunity to hang out with a fun crowd of baseball-loving locals and be part of a community rather than stuck in a tourist trap. 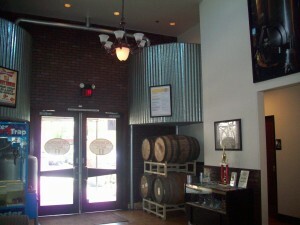 Visited: July 2012 Update: this brewery has since closed. Brew Basics: While not one of our top spots, a decent alternative to the traditional chain (suburban) options. Rancho Cucamonga – or at least the part of Rancho Cucamonga we visited – seems to be a series of never ending strip malls. So it seems fitting that it appears as though you will be turning into one as you approach the ballpark, and that the brewery is actually part of one. A very confusing one. The signage for the mall is designed to get your attention as you zoom by on the bordering highways, and not to actually get you to your destination once you have foolishly turned into their parking lot. 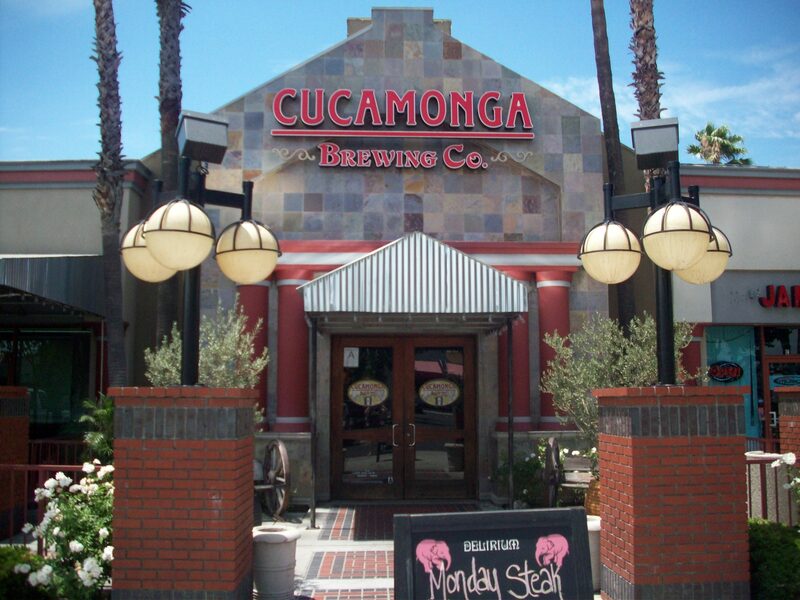 Several wrong turns, and one dead end to the dumpsters later, the entrance of Cucamonga Brewing Company was identified by a sign that was big, neon, and facing in a direction that was anything but useful. Cucamonga is one that seems to be more restaurant than brewery. It’s a local hangout on nights when you don’t have to work the next morning, and oh yeah, the beer you can drink at this bar is actually brewed here. The lobby/entrance area is reasonably sized, but crammed with barrels (presumably for the beers?) people waiting for the bathroom, and a live lobster vending machine game (horrible). The space ends in a host stand, which the rest of the establishment opens up behind. The main area is divided into table and booth dining room seating to the left, a bar area with stools and bar tops dead ahead and a lounge area with couches and band stand up a half set of stairs to the right. 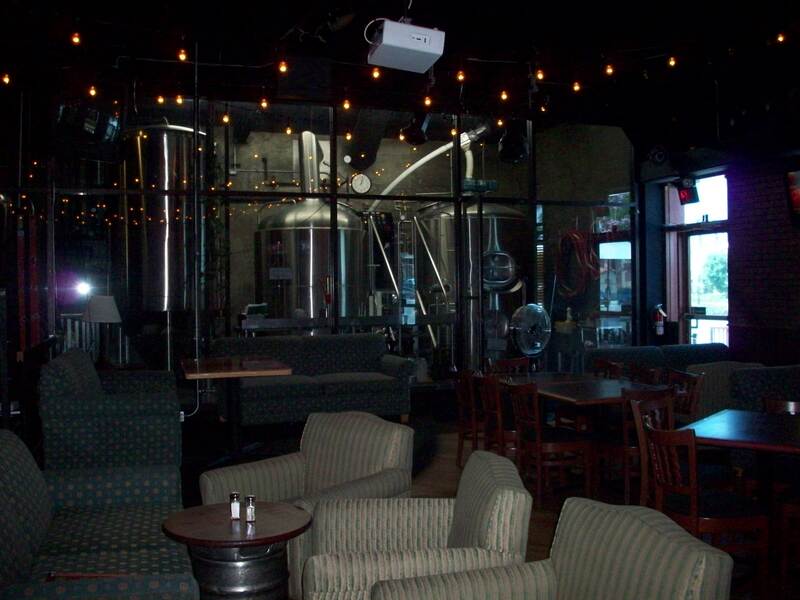 The brew works seemed moderately sized, and were housed in the far corner, buffered by the bar and upstairs lounge. The whole place was very dimly lit, save for the glow from the various tv’s and , an electronic neon jukebox affixed to the wall. Though there were a handful of people in for a pricey lunch, the place seemed to be skeleton-ly staffed (albeit with a very nice girl) and just in a holding pattern until the nightly dance of the young and bored in suburbia could begin. Overall the beers were decent, but didn’t seem to be the main focus of the place. It was nice to have the option to try something different and local instead of the usual; and (contrary to what my GPS believes) it is actually a very simple walk from the brewery to the ballpark, thereby linking two things very dear to our hearts. More than one of the standard options were tapped out, but they did have one special on tap, which the bartender was not sure qualified as a “seasonal” but considering it was a peach wheat in the middle of summer – our guess would be that it does. Rt. 66 Honey Blonde Ale ( 4.8% ABV)– Although it isn’t overly carbonated, the Rt 66 appears highly carbonated at first glance because of how fast the bubbles dance in this very yellow beer. The aroma is faintly sweet and sort of fruity, along the lines of a white zinfandel. The similarity continues in the taste as it has a soft, earthy mouth feel and tastes a lot like a light white wine as well. Peach Wheat (4.5% ABV) – A bit cloudy but not full on hazy, with a watery tarnished yellow lager color. Opposite of the Rt. 66, which appeared carbonated but really wasn’t, the Peach Wheat looks fairly flat but is quite sparkly on the tongue. It smelled very sweet and you can easily identify the peach as it is the main aroma in a beer that overall just smells like peaches turning sour. The peach is also the main flavor in the beverage, in fact they’re all but overpowering anything else. The Peach Wheat is so sweet it tastes more like drinking sparkling sour peach juice or homemade wine instead of a beer. Cucamonga Peak Pale Ale (5.6% ABV) – a goldish brown beer that like the ones before smells sweet but also has some hops. There is some brown sugar in the flavor, but the taste isn’t as sweet as the smell. Instead this medium-low carbonated beer has some slightly sour malts that lead to a hoppy finish and while it doesn’t really tastes like it smells, it’s pretty good with a solid body. Six Shooter IPA (?) – Very similar to the pale ale, but not as sour. The aroma is very faint, weaker palate and somewhat watery finish. Really the flavor of this beer is definitely more on the lighter side than a strong IPA.